Located in tranquil wooded grounds just outside the resort of Névez near the historic region of Cornouaille, Raguénès-Plage luxury camping site prides itself on the warmth of its welcome and Breton hospitality. With 3 outdoor pools, a circular indoor pool, a twisting 3-lane water slide and a relaxing sauna, there is something for everyone in the pool complex. Thatched parasols on the terrace add to the beachside ambiance. The toddler’s pool has gently sloping sides and small water slides for safe fun and games. An indoor fitness area, 2 playground areas and trampoline ensure the whole family stay active. In high season guests have a choice of table tennis, football, basketball, volleyball and boules. The campsite’s qualified entertainment staff organise animation programmes for all the family during the summer season. Based on the wishes of the guests, activities for adults include water polo, archery and aqua fitness, whilst for youngsters the camp has its own kid’s club. Christened Tahiti by locals, Raguenez beach is just a short stroll down a private footpath. 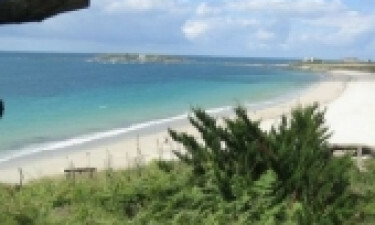 This wonderful Blue Flag beach is an idyllic spot for the whole family. Children can gather shellfish or splash in the shallows, whilst for swimmers it's paradise. To the west, other beaches are easily reached on foot. Long sandy beaches alternate with sheltered coves, wild bays and tiny harbours. The picturesque fishing village of Port Manec’h has lovely beaches and sits at the mouth of the Aven River. A popular seaside resort during the Belle Epoque, beautiful residences sit alongside fisherman’s cottages in the charming streets. For hiking there are 50km of marked and unmarked routes along lanes, fields, clifftops and seashore. The path along the coast from Raguenes to Pont-Aven is part of the GR 34 route. Kerascoët is a delightful village next to Névez with fantastic markets for shopping. For an action-packed day out visit Odet Loisirs Amusement Park and ride the zip wire over the lake! Walk the ramparts of Concarnau’s old town for spectacular views, or witness La Criée, the early morning fish auction for a fascinating experience. The restaurant serves local dishes and seafood. There is also a takeaway and bar. A-well stocked grocery caters to all your luxury camping needs.